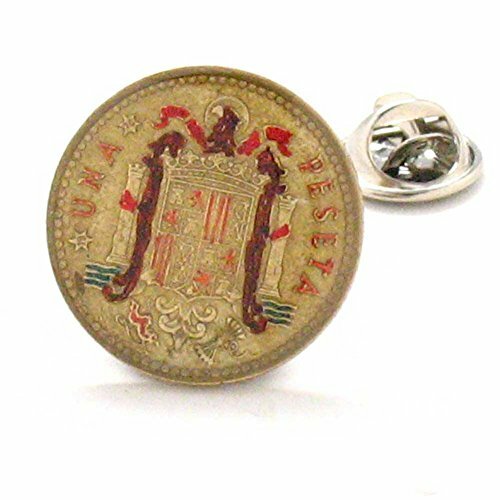 These lapel pins are made from vintage Spanish Pesetas, bearing the Seal of the Nation. Spain, a country on Europe's Iberian Peninsula, includes 17 autonomous regions with diverse geography and cultures. Capital city Madrid is home to the Royal Palace and Prado museum, housing works by European masters. Segovia has a medieval castle (the Alcázar) and an intact Roman aqueduct. Catalonia's capital, Barcelona, is defined by Antoni Gaudí's whimsical modernist landmarks like the Sagrada Família church. Each coin is hand painted, then stripped to reveal its intrinsic beauty, given an enamel coating and placed in a beautiful gift box. Our lapel pins are the perfect accent to set off any suit or formal wear. Stay classy my friends.